It lets you do both, see? Parallels has launched the latest version of its virtualisation software for Macs, bringing integration with cloud storage services and support for OS X Mavericks. 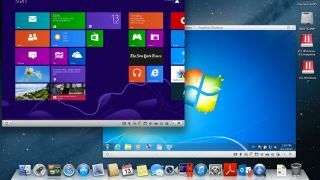 As with previous versions, Parallels Desktop 9 for Mac primarily lets you use Windows and OS X applications simultaneously without needing to reboot into a different OS through Boot Camp. Mac users running Windows 8 in a virtual machine will now get Parallel's own version of the much missed 'Start' menu. That's ahead of actual PC users running Windows 8 that will see its return when Windows 8.1 lands next month. The company is claiming "up to" 40% improvement in disk performance with version nine, a 25% speed boost when starting up and shutting down virtual machines, and a 20% reduction in the time needed to suspend them. Other features include Power Nap support on Retina MacBook Pro or MacBook Air models to resume quickly when coming out of Sleep mode, Mac gestures such as Dictionary lookup in Windows applications, Thunderbolt and Firewire storage device support, and a new Security Center that hunts down security software subscriptions to keep protect virtual machines from viruses. Parallels Desktop 9 also includes support for syncing up to cloud services like iCloud, Dropbox, Google Drive, and SkyDrive. Parallels Desktop 9 for Mac is available from today as an upgrade for current Parallels Desktop for Mac users. The full version can be downloaded from Parallels' website from September 5, and packaged versions of the software will hit the shelves at Apple retail stores on the same day for £64.95 (US$79.99, or AU$90). For a limited time, Parallels Desktop 9 for Mac customers will get a six-month trial to Parallels Access for iPad, which the company released yesterday. Access is a remote desktop solution that shrinks legacy Windows and OS X desktop programs to make them fit the iPad's screen, allowing them to be used like native apps on Apple's slate with full gesture support. We ask: What are the best virtualisation monitoring and management tools?